Dustless blasting is a cleaner, and faster method of paint removal and rust removal. Unlike with traditional sandblasting, there is no need for annoying containment areas as with dustless blasting there is no dust plum that can make an awful mess. This makes it great to use in areas around your home and even on the job. With dustless blasting you will no have to worry about particles in the area hurting your family and pets or your workers on the job. You can go about your daily business beside us while blasting away and never have to worry about the dust. It is a great way to get the paint or rust away. Well, the most notably good reason to use crushed glass blasting over sandblasting is the fact that there is no dangerous dust plume to worry about. There is very little and easy clean up because the water used in dustless blasting contains everything from the media blasting to the paint or rust. You can safely use this around your home without needing to worry about your family or pets. It is also great on a job site because of the fact it is contained there is no need to shut down your workflow to allow for the job to be done. We can work side by side with you. It is also much better for the environment because of the lack of dust. It is just a great alternative way to get rid of paint. Dustless blasting uses water to create the needed pressure to remove your paint and rust. It also does it in a faster way that allows for quick work at the paint removal or rust removal. The surface will be nice and clean and ready to apply a new paint job with just one use of the abrasive blasting. Once again you can thank the water for this as it will clean away any contaminants on the surface allowing for the perfect surface preparation. And because of the water, it traps any debris that comes off during the process allowing for an easier cleanup job. This is why so many people now choose this method over traditional sandblasting methods. It is far safer to use and much more efficient when talking about paint removal or rust removal. And because you don’t need to worry about being contained in a suit or an area it also allows our staff to work faster and better. We can get away with the surface preparation much faster as we will be able to move around easier. As well because it uses water, there are no worries of fires starting from the friction sources say from other methods of abrasive blasting. Just all around safe and clean. 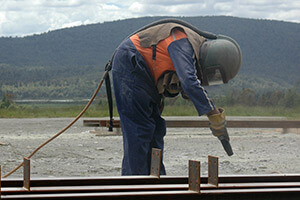 Dustless blasting is gentler on surfaces than traditional sandblasting. Because of this, you can use it for many different surfaces from wood to masonry without worrying about the damage that abrasive blasting can cause on surfaces. So no worries of wood splintering and masonry chipping. It is just your all around blasting method.